They call it the 'Gig Economy', also to distinguish it from the old economy. The phenomenon is more widespread in the US market and absorbs 49.6% of the ads. Among all the advantages of self-employment there is first of all the flexibility that only working for delivery or ridesharing companies can offer. Uber, Lyft, Postmates, Doordash and Instacart here are some names of the Gig Economy. There are now so many companies offering jobs opportunity and sometimes it is difficult to choose for whom to work. In this article we focus on two companies that seem very similar at first glance: Postmates and Instacart. At the end of this article you will know everything you need to know to make your choice and decide who among Postmates and Instacart is right for you. Why work as a driver for Postmates or Instacart? Postmates and Instacart, as well as their competitors (Doordash and Caviar), do not offer a fixed salary, but collaboration contracts. Precisely for this reason it is the right solution for those who want a few extra money at the end of the month or for students. Working for Postmates or Instacart, surely you can maximize your earnings and have more money in your pocket. Finally if you're looking for a job that doesn't require a lot of commitment and qualifications, this job is for you. What are Postmates and Instacart? If you know the etymology of the Gig Enomomy, this is a fairly recent term. It is born thanks to the creation of applications and websites that offer services 'on demand'. In addition to being appreciated for their services as a user, Postmates and Instacart present themself as the right solution for those who want to work as delivery driver. Postmates and Instacart are two platforms and work respectively through Postmates App and Instacart App. But what are the differences? Postmates platform is an easy and reliable way to get the food and merchandise you love delivered. You can order just about anything with the Postmates App. In fact, the main purpose of Postmates is to help people unlock the best of their cities – and their lives, with an insanely reliable on-demand “anything” network. Instacart is a grocery delivery service. Customers select groceries through the Instacart App or Instacart website from various retailers. As a Instacart Full-Service Shopper contractor you have to shop and deliver the customer’s order. In which cities can I work for Postmates or Instacart? Postmates was founded in 2011 by Bastian Lehmann, Sean Plaice, Sam Street. On September 18, 2018 Postmates, the on‐demand delivery pioneer, announced that it raised $300 million led by Tiger Global Management LLC (“Tiger”), on the heels of a record‐shattering year of growth, market expansion, and adoption of the industry’s first subscription service. Postmates is actually available in more than 450 U.S. cities and Mexico City. Check our complete list of cities with Postmates. Instacart was founded in 2012 thanks to an idea of Apoorva Mehta. Instacart is growing fast and now available to 70 percent of all households across the country. You can take a look at this list of cities with Instacart. The list of qualifications is not so complicated either for Postmates or Instacart. What changes is the flexibility that only Postmates offers, to make deliveries with any type of vehicle (motorcycles, bicycles and in some markets even just walking). Sceduling Delivery: With Postmates you do not need to sign in shifts and schedule deliveries. All Postmates drivers have the same job opportunities and there are no priority pings. With Instacart as well as with Grubhub you need to schedule in advance your deliveries shifts. Sometimes it is very difficult to obtain the full time hours you need. When there is an abundance of "Shoppers", you will NEVER get performance bonuses because they have too many Shoppers. When you are actually shopping for groceries for Instacart, you are timed and must meet performance goals. When you can't easily find suitable replacements or have to deal back and forth with the customer on such a replacement, you can't meet those performance goals. “Life is a matter of choice,” says Schwartz. “But, is this good news or bad news?” With so many choices, people find it difficult to make any decision at all. If you’re currently considering looking for a new job soon, perks, benefits and higher salary are so important. 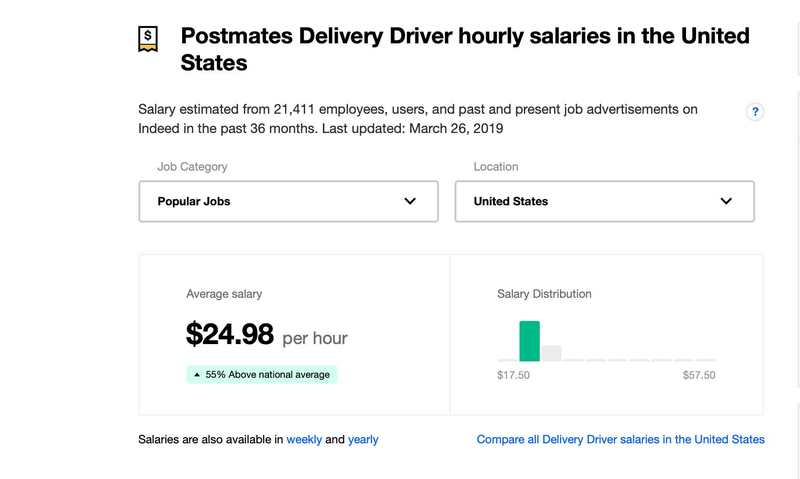 If earning more is a fundamental need for you too, take a few minutes to see this review of Postmates drivers and Instacart Shoppers hourly pay. 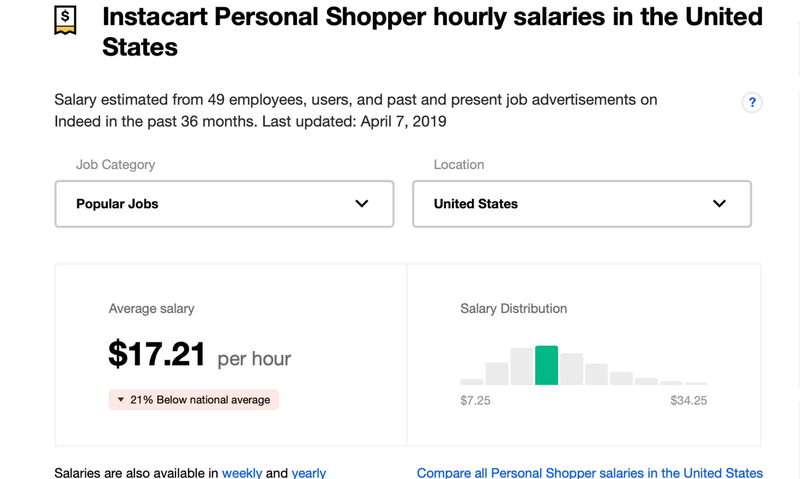 According to Indeed a Instacart Full Shopper earns $17.21 per hour. That is 21% below the national average. While a Postmates driver earns $24.98 per hour. That is 55% above the national average. 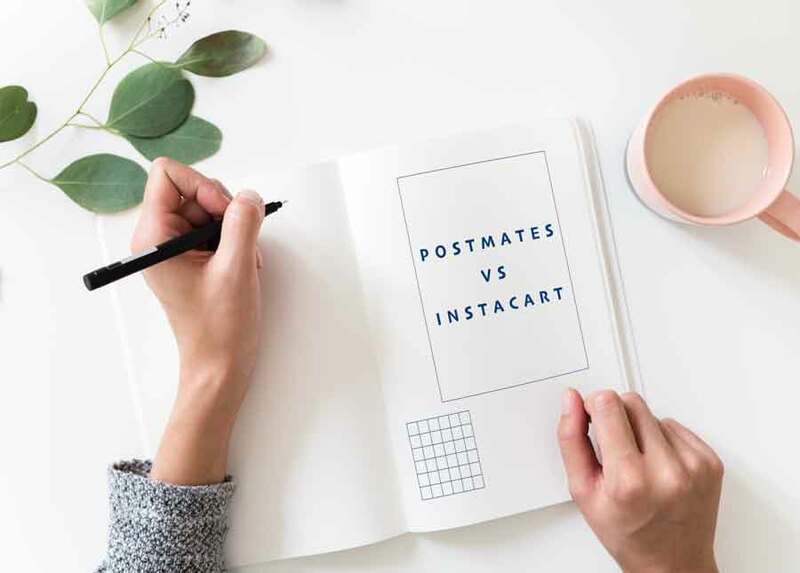 Postmates vs Instacart: How much can you earn? Important Reminder: Earnings from working as a Postmates driver or Instacart Shopper vary based on the number of deliveries made. The more hours you spend on this activity, the greater your chances of earning. In fact, every driver can freely decide how many hours to work and on which days of the week. If you are curious and want to learn more about the background check you can check our accurate guide on Postmates background check. Earnings Guaranteed: For example, if you are a Postmates driver in San Francisco Bay Area, Postmates will offer you the possibility to earn $300 if you make 30 deliveries. Tips are not factored into your guaranteed earnings total. Bonus Per Delivery: Earn an additional bonus for every delivery accepted within a specified timeframe and completed. Share your Postmates Referral Code: You can use your Postmates referral code to invite new drivers in the Postmates platform and eran money. Quality Boost: For example you qualify for $3 for every 5 star raiting orders. Sign up for Postmates or Instacart is free. You will work as an independent contractor. If you’re not satisfied with the pay rate you can always change. After a first analysis Postmates offers more incentives to their drivers. You can also maximize your earnings with our tips and tricks for Postmates drivers. Recenty Instacart had a deceptive business practice. They used customer tips to subsidize the $10 per delivery minimum payment the company guarantees its workers. Instacart will change this controversial tipping policy. Like Uber Eats, Postmates guarantee that 100% of the customer’s tip goes to the worker. The previous Instacart pay model and bad tips practices have attracted much criticism from current Instacart drivers and customers. Many of whom have chosen to work only on other platforms. In general we believe that working for Postmates is more flexible, it does not require you to sign in work shifts in advance. The possibility of using a motorcycle, a bike or making deliveries walking is a chance that only Postmates offers. Finally, Postmates sign up bonus and incentives make the job more lucrative.